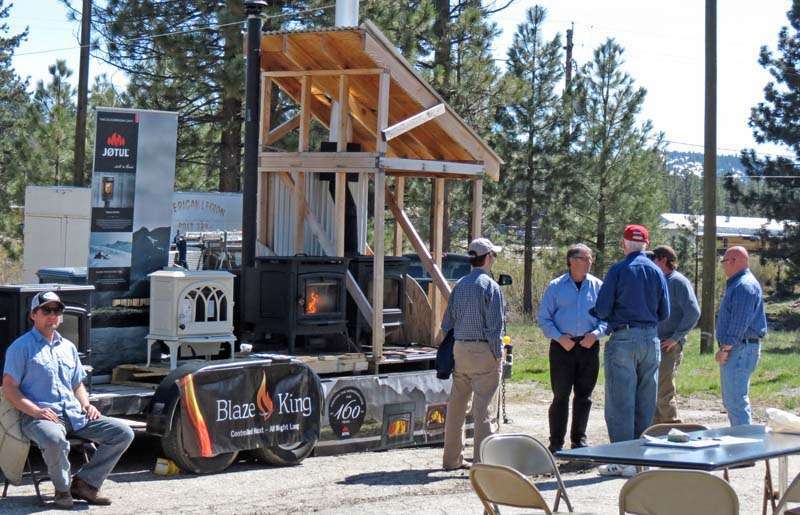 The Northern Sierra Air Quality Management District held its second annual wood stove fair at the Veterans Hall parking lot in Portola on April 21. 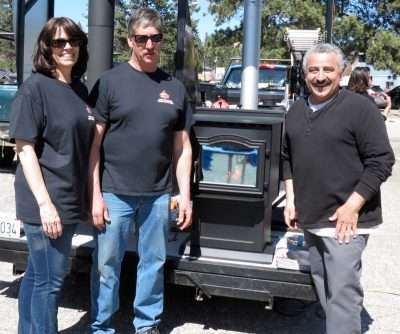 The wood stove fair was intended to educate and promote the wood stove change-out program to qualified homeowners within the greater Portola area for replacement of non-EPA certified wood stoves with new, efficient, cleaner burning EPA certified devices. The Portola area is a PM2.5 non-attainment area, resulting in efforts to minimize the air quality effects of wood burning stoves. The stove change-out program is funded by the EPA’s 2015 Targeted Air Shed Grant Program, the air district’s AB2766 program and other agencies. This five-year voluntary program is only available to residents within the non-attainment area. 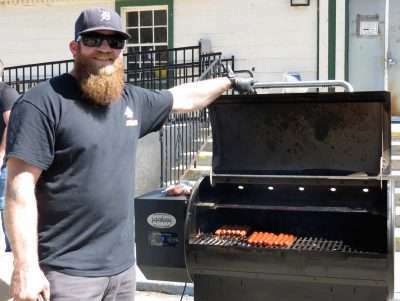 The event was attended by representatives of the EPA, the state air resources board and Hearth Patio & BBQ Association who traveled from the San Francisco and Sacramento areas. Representatives answered questions regarding wood stoves, air quality and more. Corby Erwin of Plumas-Sierra Rural Electric assisted with the event at the sign-in table, as well as Maricela Ramos, greeting all comers with a smile and opportunities to win prizes such as a wood shed and Leonards’ gift cards. There were also “swag bags” handed out, filled with information on fire safety, some of which was contributed by Hannah Hepner of the Plumas County Fire Safe Council. stoves, propane stoves and efficiency-model wood stoves. 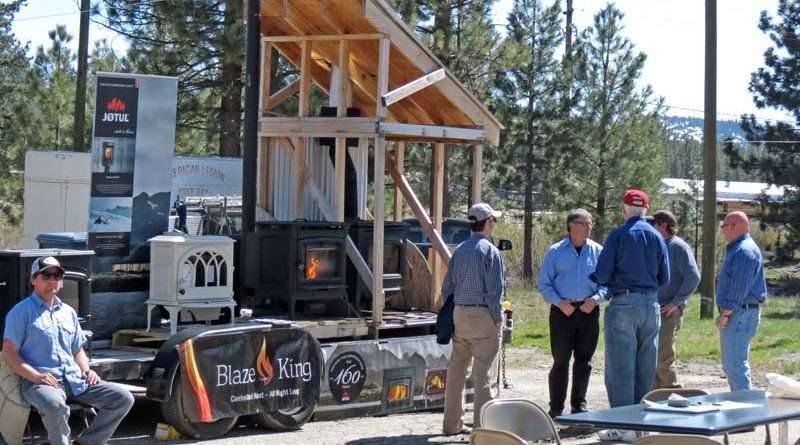 Wolf Creek Wood Stoves, with locations in Greenville and Portola, showed off efficient models to heat homes. The Quincy Hot Spot in Quincy also brought efficient stoves. Both retailers have been a part of the effort to change out wood stoves in the Portola area since the inception of the program. 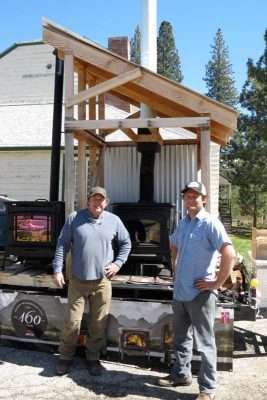 Thirteen new applications for the wood stove change-out program were received at the fair, with three additional applications received after the fair took place. The program specifies that those who live in Zone 1, or inside of the Portola sphere of influence, would qualify for a fully funded pellet or propane stove. Those choosing to stick with traditional wood burning stoves may qualify for a $1,500 rebate upon stove replacement, and those immediately outside of Portola may qualify for a $3,000 rebate for installation of a pellet or propane stove. 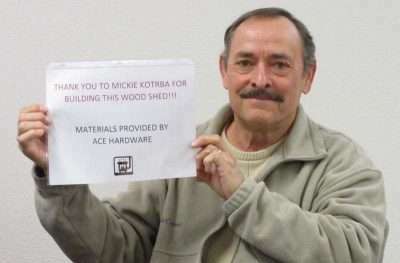 At the air district board of directors meeting April 24, prize winners were chosen at random by Sierra County Supervisor Paul Roen and Plumas County Supervisors Sherrie Thrall and Michael Sanchez. 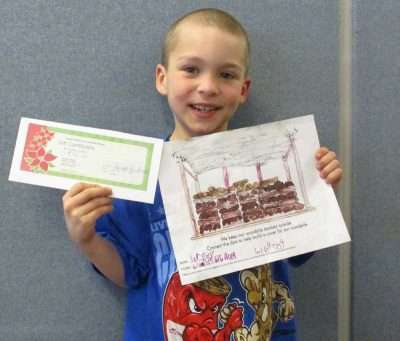 Two $50 gift cards to Leonards Market went to Dan Laird and local C. Roy Carmichael first-grader Grady Madden. The woodshed winner was a very excited Loretta Crumley. For those interested in learning more about the program, visit myairdistrict.com or contact Ruiz at 832-0102. If the Northern Sierra Air Quality Management District was promoting these filthy wood burners then they should all be sacked. How dare they dare allow vile, pollutting wood burners onto everyone. What a betrayal. There is only one word for them; scum. Did they not get the memo? Wood smoke is toxic pollution. All wood burning needs to be banned. Great, then people who can’t afford the fossil fuel generated heat should just freeze to death or move? Do I smell “elitist”? Not quite sure how having air clean enough to breathe is elitist. There are clean ways to heat your home without wood and without fossil fuels. Electric heat pumps are cheap to run. Wood smoke remains too toxic to have in residential areas even if people are ignorant of the science proving that statement. The facts remain. Wood smoke kills. I wish they had this program in Quincy. This is a joke is it not. Burning wood contributes to bad air quality in spades no matter how its burned. If wood stove to wood stove exchanges worked, then Libby, Montana would have clean air. Virtually every wood stove in the community was replaced with a new certified one. Before the Libby changeout, 80% of their pollution came from wood stoves. After the changeout, 81% came from wood stoves, and levels of some air toxins even increased. Today, Libby is on the EPA’s list of cities most polluted with fine particulate pollution, largely from wood stoves. The only thing that cleans the air is to remove wood stoves and replace them with non-wood-burning sources of heat. No air quality management district should be promoting wood stoves. The only people who are going to benefit are people who work in the hearth industry.